Poor eating habits can undermine even the best efforts to stay fit. 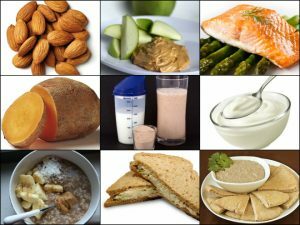 Savvy athletes know that eating the right foods before a workout can give you the necessary fuel to make it through the last five minutes on the treadmill or through that last set of squats. So, what should you eat before you hit the gym? While every body is different, you can follow the guidelines below to stay strong even during your toughest workout. People often assume that the best fuel for exercise, especially strength training, is protein. While protein plays an important role in muscle building and repair, carbohydrates are actually what keep your body energized during long workouts. To repair muscle damage, your body needs protein, which is made up of amino acids, the building blocks for your muscles. An adequate supply of protein will help your muscles recover from workout stress, especially if you engage in weight-bearing exercise, such as weight-training or jogging. Including some protein in your pre-workout meal may help reduce post-exercise muscle soreness. Many people try to limit the amount of fat in their diet, but cutting it out completely can actually hinder athletic performance. Fat provides fuel for the body. If your workouts typically last more than an hour, your body uses fats for energy after your glucose supply has been depleted. However, you should keep in mind that some fats are more beneficial for people than others. When it comes to gearing up for workout, carbs are your gym BFF. The key is to have a mixed bag of complex and simple ones so that the release of energy during your workout is slow and steady throughout your routine. Whole-wheat toast with fruit gives you both types of carbs with the bonus of being super easy to digest.